Please see the FAQ's page for how to buy your Anita's Balm with Insurance! Please see the FAQ's page for how to buy your Anita's Balm with Insurance!Please see the FAQ's page for how to buy your Anita's Balm with Insurance!Please see the FAQ's page for how to buy your Anita's Balm with Insurance!Please see the FAQ's page for how to buy your Anita's Balm with Insurance!Please see the FAQ's page for how to buy your Anita's Balm with Insurance! Thank you again for making the trip to Macon. I've been using the balm since Friday afternoon and have already noticed a difference! I will definitely be making future purchases. We use only first cold pressed extra virgin olive oil and natural beeswax. For use on any dry skin. 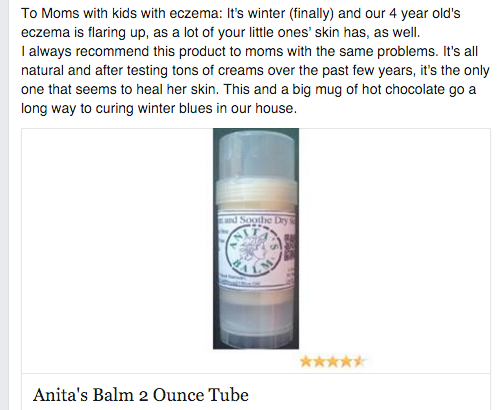 Anita's Balm is a soothing treatment for those who suffer from eczema, psoriasis, and other ailments caused by dry skin.